Not a single “like” clicked when first posted 20 December 2009. A few comments but zero likes. It’s one of my favorites. Deborah McLaren’s still life is one I purchased at the PERSAD Celebrate Life Celebrate Art auction held at the Carnegie Museum of Art in Pittsburgh last May (2009). The other day I sat at the table, looked up and saw Steve’s additions to the decor. He’s been purchasing RITZ crackers frequently since I bought the painting- subliminal influence? I wrote to the artist for her permission to post the image of her painting along with his props. Steve’s fun additions- the unexpected sight of them in front of the still life- I laughed out loud! The title of today’s post comes from a conversation I had with one of the guards in the gallery. 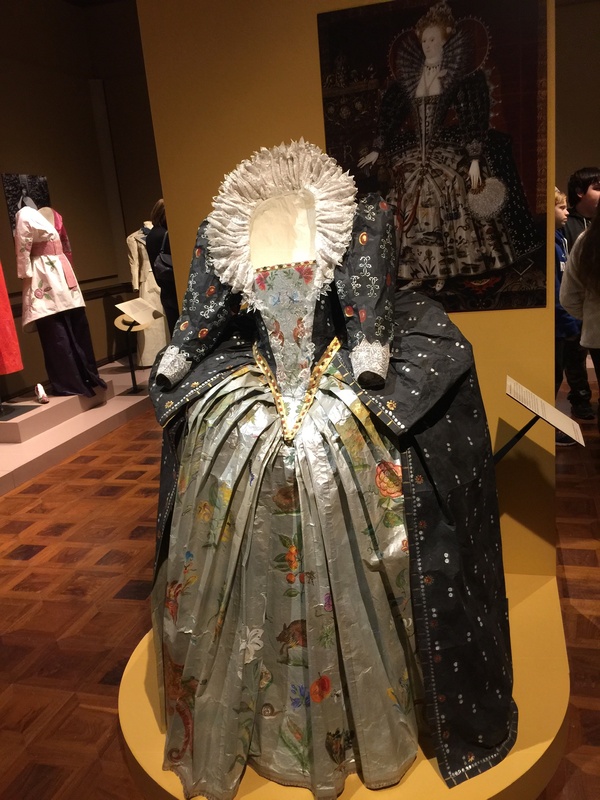 He has seen two women lie down on the museum floor to look up the dresses ( he thought they had fainted), two men blow on the hanging costumes to get them to move (saliva included) and a 5 or 6 year old ran into the Queen Elizabeth gown the other day. Today I saw a woman reach to touch the gossamer lace on a collar. 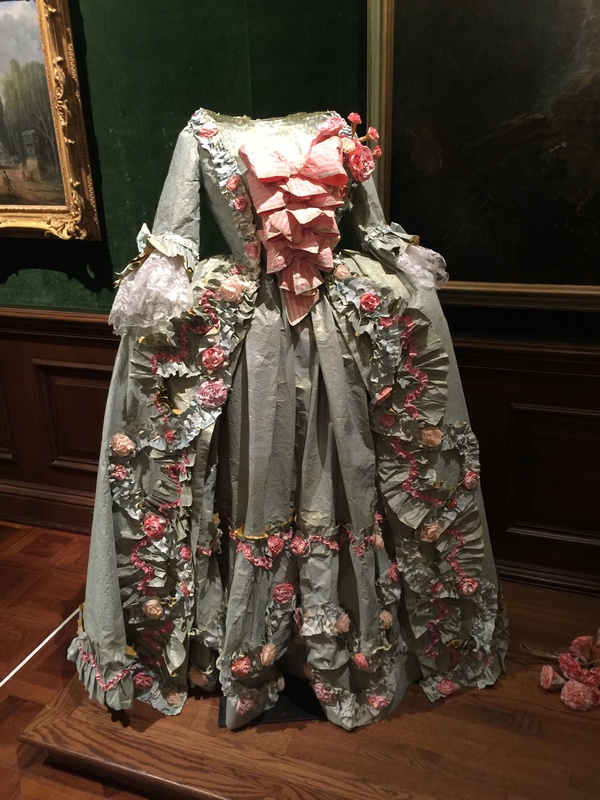 It’s hard to fathom that the gorgeous costumes/sculptures are made entirely of paper but they are. You can touch the paper on this table in the rotunda. Artist Stephen Hankin, painting at The Frick, Pittsburgh. Although I interrupted his concentration, he graciously allowed me to photograph him at work. Said I could blog him, too. And here I was wondering what I’d photograph after the People at Work Show was over. If you live in Pittsburgh or plan to visit and would like to tour his studio (where he has 180 paintings on the walls) you can contact him stephenhankinart(at)gmail(dot)(com) The front of his card shows his studio with paintings on the walls. Right in Millvale PA, across the Allegheny River from Pittsburgh. When I parked on Grant Avenue, I noticed the banner sign on the lamppost and remembered seeing these dramatic and stunning murals at St. Nicholas Church. Information on the website link about how to get a tour and how to support the preservation of these significant and historic artworks. It’s been a fun week of colorful collages. Once I got started it was hard to stop. A lot of response was generated by the different colors and it’s made me see the trend in my photography, color wise, what I’m drawn to….besides the human element. The clothes we choose, our dishes, the bed linens and artwork which surround us in our lives. Many have commented on which color is their favorite. Right now everywhere I look it is green green green We’ve had a lot of rain. Unexpected. Driving home after dinner out. Down a back alley parallel to on Butler Street. As Steve said- you just never know when you’ll find a Van Gogh.